For over two years now my friend Ruben has told me about a couple who sell the best tamales and champurrado in town. Finally everything worked out so that yesterday Ruben and I were able to finally go together to have a delicious early morning meal down by the truck docks. 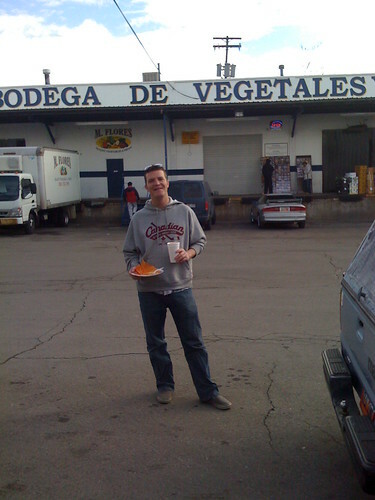 Ruben has family and friends who work for M. Flores produce so this is where he learned about our friend “Rey” who serves delicious tamales from his pickup in front of the truck docks. If you’ve ever wondered where great restaurants such as Red Iguana get their products like fruits and vegetables, they come through M. Flores. Many products are imported directly from Mexico and are then made available via delivery or direct pick-up. We will talk more about M. Flores and the delicious things I found another day. Ruben and I meet up at 9am and we drive along 600 W since it is the easiest way to navigate under the spaghetti mess of on-ramps and off-ramps of Salt Lake City to reach our destination of delicious truck tamales. As we arrive we see the activity of many trucks getting loaded and nearby a small silver Mazda. But no one is near the truck. Ruben calls out “Oye! Tamales!” but no one responds to his cry. We look near the tailgate and we see the buckets containing bags of steaming tamales. For a moment, I thought Ruben was going to help himself. Then he walked around to the front and punched the steering wheel to let out two looooong honks. Finally, Rey came out of a door and we were in business. Ruben enjoying a hot pepper along with his tamales. Rey is an incredibly nice guy from the state of Guerrero in Mexico. He has a wide smile and has some impressive bling in the form of a cross hanging from his neck. He told me that he and his wife (she might be there when you go) have been selling Tamales in Salt Lake for over 10 years now. While there are many places to buy tamales in Salt Lake, Rey tells me that they has lifelong customers because they tell him that he and his wife’s tamales are made with corazon. Rey tells me that today he has cheese, chicken and pork tamales and asks me what I would like. Immediately I tell him that I want to try all 3. Immediately Ruben stops eating. He points at me and it’s clear I’m about to get a lesson. Never order more than one tamal at once since you first need to try them to see if they are good. If they are not rico, you do not pay. Tamales are best eaten steamed, so let them stay steamed in their bag as long as possible. Order them one at a time. I start with the cheese and it is divine. I’m usually not a fan of cheese tamales, but it was hot and melted and a delicious morning treat. Rey also served me up a warm cup of champurrado which was the best I’ve ever tasted. On some days he and his wife serve champurrado (chocolate flavored) but on other days you get normal atole which is not sweet. On those days he brings along a delicious candy which we will talk more about another day. Drinking up the last bit of my champurrado. What a delicious 9:30am meal. Behind the trucks are loading to deliver delicious fruits, vegetables and abarrotes to markets and restaurants such as Red Iguana. So go meet Rey and his wife and try these out. If you need a batch of tamales, the prices are incredible. So if you need his phone umber, send me an email. Also, the only guaranteed hours are Saturdays at the location listed above are from 7am to 10am. At other times Rey could be anywhere around the city filling its tamal needs. 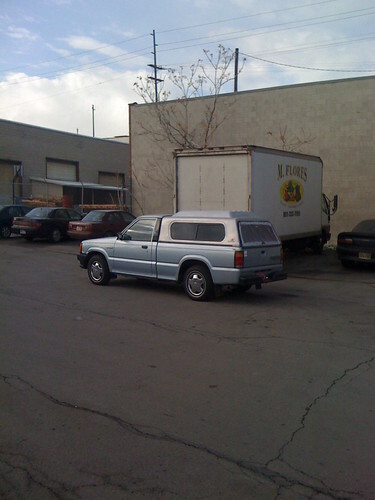 Later that day as Ruben and I were driving around the city we saw Rey in his truck. He honked and waved as we passed him on 900 W. I have no idea of the other locations where he vends his tamales, but I know at least one stop along his Santa-like route. In closing, my friend Ruben is having a very difficult time finding work in Salt Lake. If anyone has any leads or any help for this at all please let me know. He’s a hard worker and one of my favorite people. Thanks!